My name is Narcis, I am 33. I’m married and have 2 children, the first is a girl and the second is a boy. Well, I am local tour guide in Bekopaka. Bekopaka is a village next to the Tsingy de Bemaraha National Park where I am working to develop our local community. I have 8 years experience as a local tour guide. As I am a local tour guide here in Bekopaka, I had several training under the ANGAP organization. 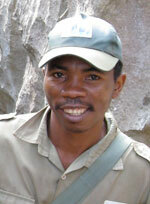 I am here to guide you for your visit to the Tsingy de Bemaraha National Park. Tsingy de Bemaraha is the only National Park on earth where there are still places where people couldn’t set foot on yet. I highly recommend the visit of this OLE under the Manambolo River tour for your honey moon.